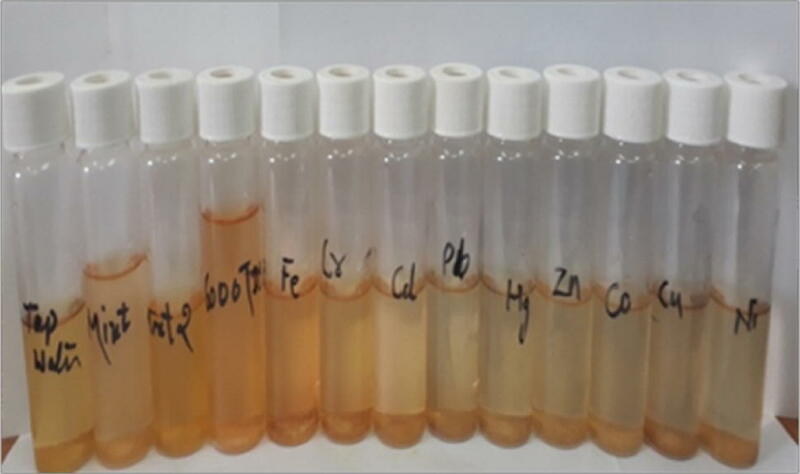 This paper describes the need for detection of iron, preparation method of colorimetric material and response studies for detection of iron in contaminated water. Iron is a membrane foulant, and high concentration of it produces membrane fouling. Membrane fouling decreases the flux rate and efficiency of salt rejection and makes the membrane more susceptible to oxidation damage. Therefore, iron detection is essential in feed water before passing through RO membrane. Under this objective, a material was prepared through reaction of 1,10-phenanthroline with ascorbic acid and trisodium citrate (weight ratio 1:1:2). The prepared material shows significant response towards iron, and it is observed through naked eye. A yellow colour to change into orange red colour was observed within 5 min when material was exposed to Fe(II) ions at 300 µg/L as per IS 10500. 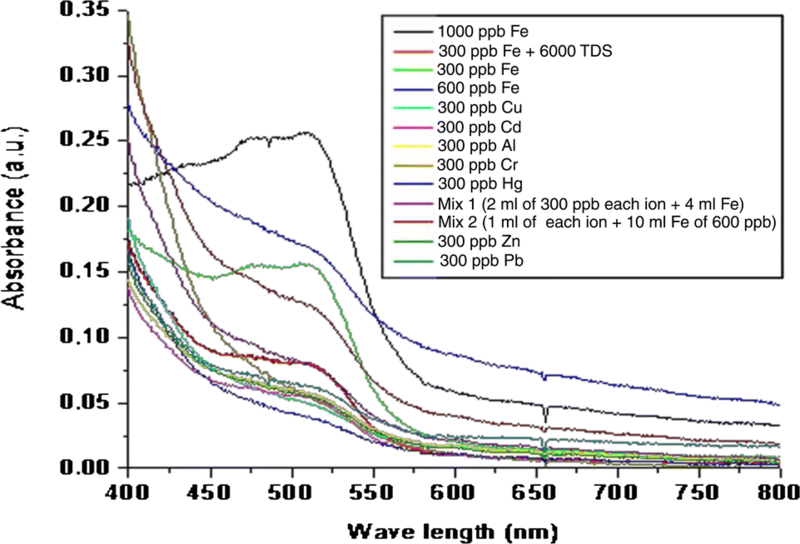 UV–visible spectra of 1,10-phenanthroline–Fe complex show absorbance at wavelength 510 nm with iron without interference of other metal ions, viz. Cd(II), Co(II), Ni(II), Hg(II), Zn(II), Pb(II) and high TDS water. Water is contaminated with various impurities, viz. TDS, alkalinity, hardness, chloride, fluoride, nitrate, pH, calcium, magnesium, iron and toxic metal ions. Iron beyond permissible limit is one of the toxic metals . Iron contamination in water is generally due to dissolution of ores, rusting and decomposition of water supply pipes . Iron is one of the foulants present in feed waters in membrane filtration processes. Iron can be found in two forms and is influenced by a variety of variables including pH, metal ions and ionic strength. Iron is present in water forms, viz. ferrous and ferric. The ferrous is water-soluble, and ferric is water-insoluble. Ferrous can be removed by iron filters, softeners or precipitation and treated with dispersant chemical. Ferrous iron is converted into insoluble ferric iron through oxidation by induction of air into water. Soluble iron can be found in deep wells, but gets converted into more troublesome insoluble iron by the introduction of air. Insoluble ferric iron oxides or ferric hydroxides, being colloidal in nature, will foul the front end of the RO system. Sources of insoluble iron are aerated well waters, surface sources and iron scale from unlined pipe and tanks. RO membrane manufacturers recommend that combined iron levels be less than 0.5 ppm in the RO feed. If all iron is in the soluble ferrous form, iron levels up to 0.5 ppm in the feed can be tolerated if the pH is less than 7. The sources of iron fouling are hydroxide flocs of oxidized iron, corrosion products from piping materials and silicates containing iron [3, 4, 5, 6, 7, 8]. Iron fouling increases RO feed pressure requirements, increases permeate TDS, decreases efficiency of salt rejection, decreases flux of product water and makes the membrane more susceptible to oxidation damage and bio-fouling. Therefore, there is a requirement to detect iron in feed water before passing it through RO membranes. With this objective, colorimetric material has been prepared and response study towards iron carried out. The colorimetric material is capable of detecting 300 ppb iron in feed water within 5 min. The thin-film composite (TFC) reverse osmosis (RO) is sensitive to iron fouling, and manufacturer recommends iron should not be more than 0.5 ppm in feed water. Most of the tube well water and other sites water is having iron in mg/L (ppm) range or more than recommended limit. Therefore, a material is required to detect iron and take decision to feed contaminated water. If it is within permissible limit or to treat it before feeding when it is exceeding the limit. This exercise increases the shelf-life of membrane and gives high percentage salt rejection. This manuscript details the work carried out in this direction and its outcome. colorimetric analysis is based on the change in the intensity of the colour of a solution with variations in concentration [9, 10, 11]. colorimetric methods represent the simplest form of absorption analysis. The human eye is used to compare the colour of the sample solution with a set of standards until a match is found . Various materials have been reported in the open literature, viz. 1,10-phenanthroline and 2,2′, dipyridyl and thiocyanate with hydroxylamine and HCl are mostly used for detection of iron in field conditions [13, 14, 15]. A number of techniques have been used for detection of iron ions in water, viz. 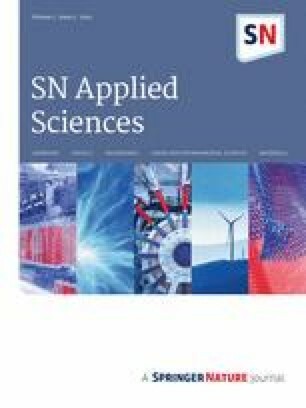 atomic absorption spectrophotometer [16, 17] and inductively coupled plasma mass spectrometry [18, 19]. However, these techniques have limitations, viz. they are costly, require sophisticated instruments and to be operated by skilled analyst, and are not possible to use in field. Various iron detection kits have been developed by different laboratories and companies. These are also able to analyse iron. These kits are having three liquid chemicals, viz. phenanthroline, hydroxylamine and concentrated HCl [20, 21]. Hydroxylamine and concentrated HCl are carcinogenic and corrosive, and safety is also required. Therefore, a colorimetric material was prepared using non-toxic and non-carcinogenic materials, viz. ascorbic acid as a mild reducing agent and trisodium citrate as a buffer for maintaining pH. 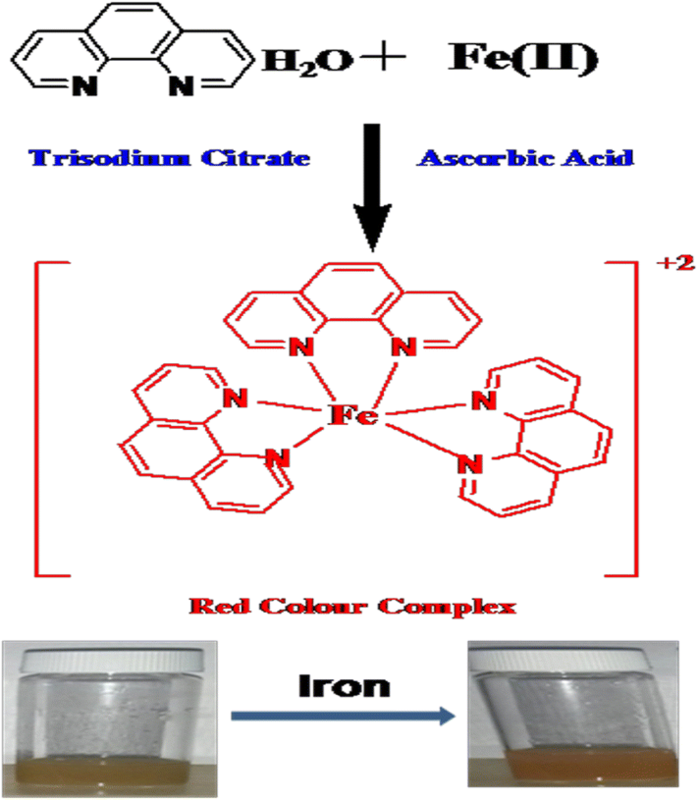 The material shows significant response towards iron at 300 µg/L concentration within 5 min. The pH measurements were made on a digital pH meter (HACH, sension 1, model 51935-00, Loveland, Colorado, USA) equipped with a gel-filled pH electrode. The meter was calibrated with the buffers of 4, 7 and 10. Absorbance spectra of material with water were recorded on UV–visible spectrophotometer Analytik Jena Specord-S600 (Germany). IR spectra were recorded on JASCO FT-IR spectrometer model JASCO-610 by using KBr pellets. All solutions were prepared through serial dilution of stock solution 1000 mg/L and concentration estimated through atomic absorption spectrophotometer Analytik Jena Nova 400(Germany). 1,10-Phenanthroline monohydrated (99.5%), ascorbic acid (99.7%) and trisodium citrate (99%) were purchased from Merck (Darmstadt, Germany). All metal ions standard solutions 1000 mg/L were purchased from Merck (Mumbai, India), and desired concentration solutions were prepared through serial dilution. All of the reagents used were of analytical grade. All laboratory wares used for analytical determination were cleaned first by trace-metal-grade nitric acid and hydrochloric acid, followed by repeated rinsing with deionized water. All the solutions were prepared with ultrapure water (resistivity 18.2 MΩ cm) from an Elix analytical reagent-grade water purification system. 1,10-Phenanthroline (5 g), sodium citrate (10 g) and ascorbic acid (5 g) were grinded in mortar and put into the sealed glass bottle. Initially, the reaction of 1,10-phenanthroline with iron was performed as a model reaction in the presence of various reducing agents and by varying reaction conditions. The efficiency of various reducing agents such as hydroxyl amine, anthraquinone, hydroquinone and ascorbic acid was studied in different mole ratios (1–2 mol%). Ascorbic acid gave best result with trisodium citrate as buffer. Effect of buffer was also studied by using various buffers such as trisodium citrate, potassium citrate and HCl for acidic condition, and it was observed that sodium citrate afforded the best results. The maximum response of 1,10-phenanthroline was obtained when the reactions were carried out using 1:1:2 weight ratio of 1,10-phenanthroline, ascorbic acid and trisodium citrate, respectively. The process involves mixing 1,10-phenanthroline, ascorbic acid and trisodium citrate in a mortar and grinding the mixture at room temperature for 10–15 min in low humidity environment. After that, the obtained product is kept in air-tight vial. The prepared material was used for detection of iron by varying quantities 0.1–1 g. After the experiment, it was found that 0.5 g is sufficient for 20 mL contaminated water. Take 0.5 g of material in glass vial and close it. Then inject 20 mL of iron-containing water into the vial and observe colour changes. The colour change and intensity depend on the presence of iron concentration. 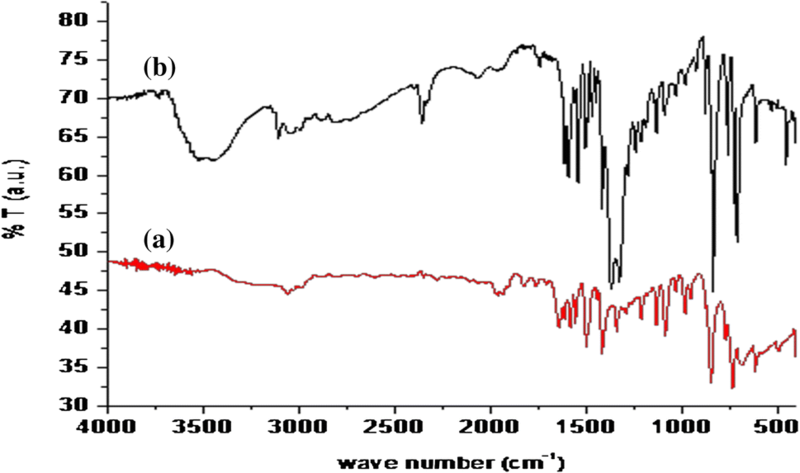 The wavelength of maximum absorbance intensity, λmax, was determined using UV–visible spectrophotometer. The FT-IR spectrum of 1,10-phenanthroline was performed (Fig. 1). The absorption bands localized at 3399 cm−1, 3077 due to C=C stretching vibrations. Strong band was observed at 700–900 cm−1 and 1400–1650 cm−1. The strong bands 735 and 885 were assigned to pyridine molecule. The FT-IR spectrum of complex of iron with 1,10-phenanthroline was obtained similar to phenanthroline but strong band appeared at 714 cm−1 due to complex of Fe(II). The colorimetric material was prepared successfully and evaluated for detection of iron by varying parameters, viz. quantity of material, the presence of other metal ions and pH. The colorimetric material was prepared using non-toxic and non-carcinogenic chemicals such as phenanthroline, ascorbic acid and trisodium citrate. Toxic and carcinogenic materials, viz. HCl, NH2OH, were used for detection of iron in the most of reported methods. Take 0.5 g of material in vial, and inject 20 mL of contaminated water. Initially, the experiments were carried out with distilled water, 300 µg/L, 600 µg/L and 900 µg/L iron-containing water. The red orange colour appeared within 5 min with 300 µg/L iron-containing water. 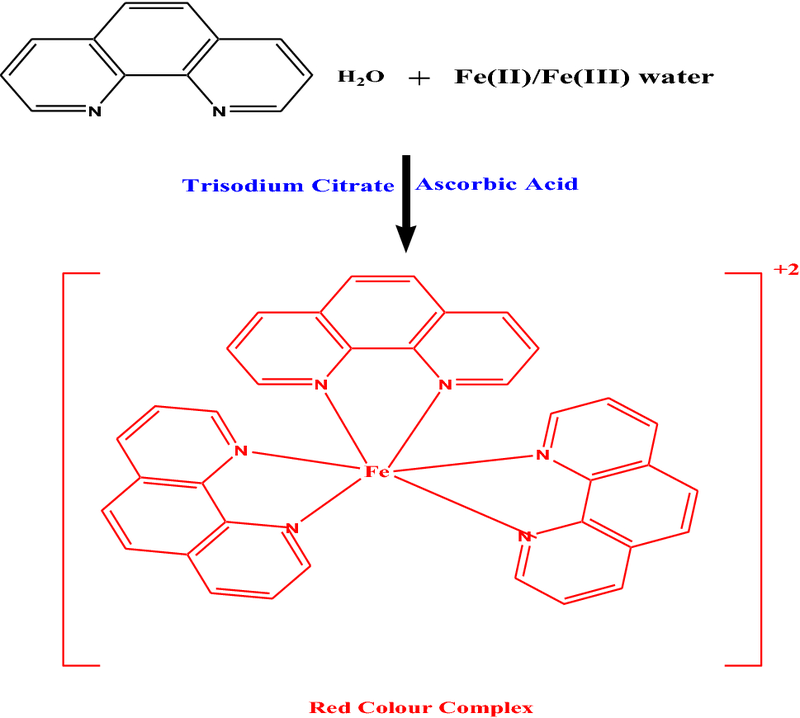 The colour intensity of solution increased with increasing concentration of iron as shown in Fig. 2. The wavelength of maximum absorbance intensity, λmax = 510 nm, was obtained as shown Fig. 2. This large value indicates the complex absorbs very strongly. The intensity of the colour is independent of pH in the range 2–9. The complex is very stable, and the colour intensity does not change within 2 days of time (Fig. 3; Scheme 1). Advantages of ascorbic acid use as reducing agent are as follows: ascorbic acid reduces Fe(III) to Fe(II) more rapidly and is not carcinogenic. Trisodium citrate is used as a buffer for adjusting the pH value of reaction between 3 and 7. The evaluation studies were carried out for different metal ions, viz. Ni, Cu, Co, Zn, Hg, Pb, Cd, Cr, Fe and high TDS, separately as well as contamination of the above-said metal ions in high TDS (6000 mg/L) water. The result in Table 1 shows that the material showed no change in colour with Ni, Cu, Co, Zn, Hg, Pb, Cd, Cr and high TDS separately and mixer of metal ions in high TDS water. But the material shows colour change in the presence of iron with different ions. 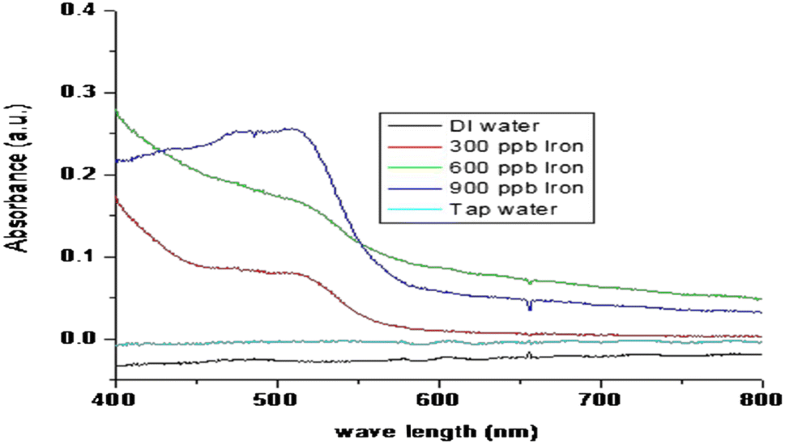 Hence, material has no interference of other metal ions during detection of iron in contaminated water (Fig. 4). Absorbance studies of solutions were carried out with UV–visible spectrophotometer for maximum absorbance intensity; λmax = 510 nm was obtained for iron (1000, 600, 300 µg/L), mixture 1 and mixture 2 and high TDS with iron. No absorbance was observed for Ni, Cu, Co, Zn, Hg, Pb, Cd, Cr and high TDS at 300 µg/L concentration as shown in Fig. 5. The colour change and its intensity depend on the pH of solution. The colour change obtained within 5 min in contaminated water when pH between 2 and 7 due to fast complex formation of 1,10-phenanthroline–Fe. For these studies, water samples collected were ground water. These samples were analysed for iron and TDS. These samples have iron more than 300 µg/L and 6000 Mg/L TDS. The material shows a significant colour change from yellow to orange red for these samples which have iron. In conclusion, material was successfully prepared and optimized the ratio of reactants, viz. 1,10-phenanthroline, ascorbic acid and trisodium citrate (weight ratio 1:1:2). The prepared material was evaluated for colorimetric detection of Fe(II) ions in contaminated water. The material exhibited response towards Fe(II) ions, which is confirmed through colour change from yellow to orange red and UV–visible absorbance measurement. The material shows visual response with naked eye at 300 µg/L and response time 5 min. UV–visible spectra of phenanthroline–Fe complex show absorbance at wavelength 510 nm with iron ions without interference of other metal ions, viz. Ni, Cu, Co, Zn, Hg, Pb, Cd, Cr and high TDS water. It is a very simple and rapid detection method for ferrous ions and can be used as a potential colorimetric material for detection of iron ions in contaminated water. Authors are thankful to Dr S.R. Vadera, OS and Director, Defence Laboratory, Jodhpur, for guidance and encouragements. Authors wish to Ravindra Kumar, Sc-H, for providing technical suggestions during the preparation of the manuscript. Authors would like to thank Dr. M. S. Roy, Sc-F, and Narotam Prasad for extending UV–visible spectra analysis facility. We wish to thank all colleagues from Water Quality Management Group for their direct and indirect support.